McCabe was just offered a job by a congressman so he can get his full retirement. And it just might work. In this June 7, 2017 file photo, FBI acting director Andrew McCabe listens during a Senate Intelligence Committee hearing about the Foreign Intelligence Surveillance Act, on Capitol Hill in Washington. That’s one way of protesting Andrew McCabe’s firingas deputy FBI director, roughly a day before he was set to retire: At least one Democratic congressman has offered McCabe a temporary job so he can get full retirement benefits – and McCabe appears to be considering. Rep. Mark Pocan, D-Wis., announced Saturday afternoon that he has offered McCabe a job to work on election security in his office, “so that he can reach the needed length of service” to retire. Rep. Seth Moulton, D-Mass., tweeted that he’d consider hiring McCabe, too. 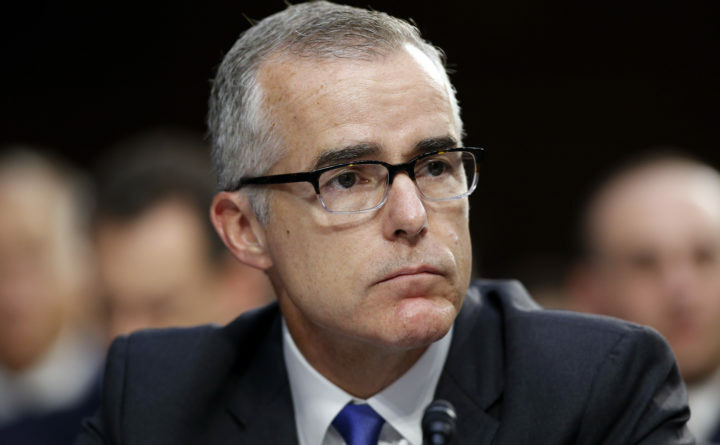 McCabe’s team is confident that he had at least 20 years of law enforcement work under his belt – defined as carrying a weapon or supervising people who do – which made him eligible to retire on his 50th birthday on Sunday, with full retirement benefits. McCabe stepped down from his FBI job in January amid attacks from President Donald Trump, but he had been using up accumulated leave to get to his birthday to receive full retirement benefits – a move Trump attacked him for on Twitter after The Washington Post reported his plans. On Saturday evening, a spokesman for Pocan said they hadn’t yet heard from McCabe on his job offer. The Washington Post’s Matt Zapotowsky contributed to this report.